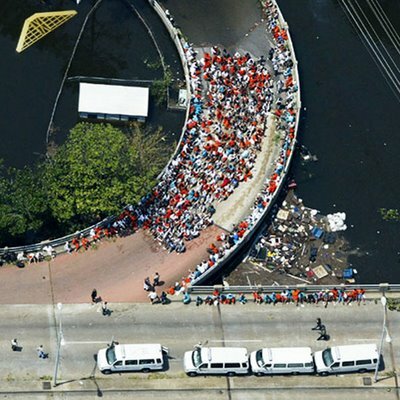 The shot of thousands of orange-clad prisoners, murderers and rapists among them, crouching on a broken bridge, held at bay, at gunpoint by a few overstretched guards, was one of the iconic images of the chaos that followed Hurricane Katrina. But who were those prisoners? What about the prisoners in the jail? the Sheriff had been asked as city leaders ordered the people of New Orleans to flee the hurricane heading their way. The prisoners will stay where they belong, he decided. 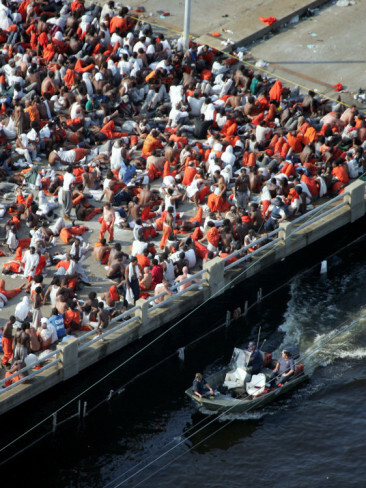 This is the untold story of almost 7,000 inmates, some never even charged, who found themselves in Orleans Parish Prison as it flooded. A year after the hurricane, find out what happened inside the jail as panicked inmates, left without food or water, rioted and broke out. Olenka Frenkiel reports on a justice system, already near to collapse – and on its final tipping point – Katrina. Find out more about the video here. ~ by neworleansmusicman on April 24, 2012. This entry was posted on April 24, 2012 at 7:13 pm and is filed under Central Lockup, Department of Justice, House of Detention, Hurricane Katrina, New Orleans, OPP, Orleans Parish Criminal Sheriff, Orleans Parish Prison.You can follow any responses to this entry through the RSS 2.0 feed.You can leave a response, or trackback from your own site. Previous: Mushroom Record Store Shuts Down Web Store!! Next: DOJ Blasts Gusman, and Gusman Blasts DOJ!! !